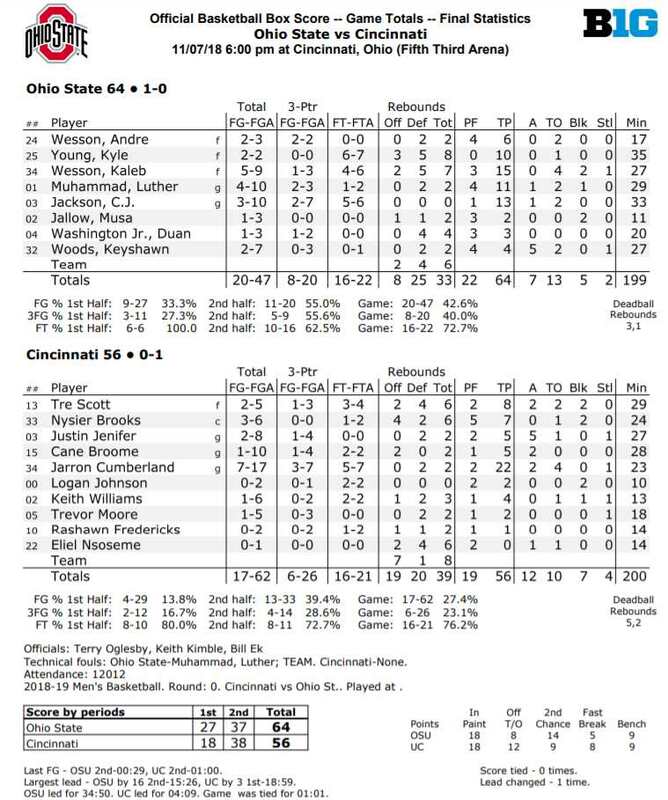 Not since Rick James scuffed his muddy boots all over Eddie Murphy’s couch has a guest been as rude as the Buckeyes in Wednesday night’s 64-56 season-opening win at Cincinnati’s revamped Fifth-Third Arena. Ohio State, led by 15 points from sophomore center Kaleb Wesson, moves to 1-0 on the season. Cincinnati falls to 0-1. The Buckeyes led for nearly 35 minutes on the night, withstanding a pair of runs late in the second half from Cincinnati. Each time, however, Ohio State was able to handle the momentum, the crowd, and some very questionable calls from a trio of referees who appeared to be new to the sport. Scoring was slow for both teams in the early going, with OSU holding a 4-3 lead with nearly six minutes gone in the first half. Back-to-back threes from freshman guards Duane Washington, Jr. and Luther Muhammad gave the Buckeyes a 10-6 lead with 12:35 to play. Ohio State would never trail again the rest of the game. A three-pointer by senior point guard C.J. Jackson gave Ohio State their biggest lead of the first half at 27-17 with 1:29 remaining in the first half. The lead would continue to grow in the second half. A three-pointer from junior forward Andre Wesson made it 38-22 OSU with just five minutes gone in the second half. 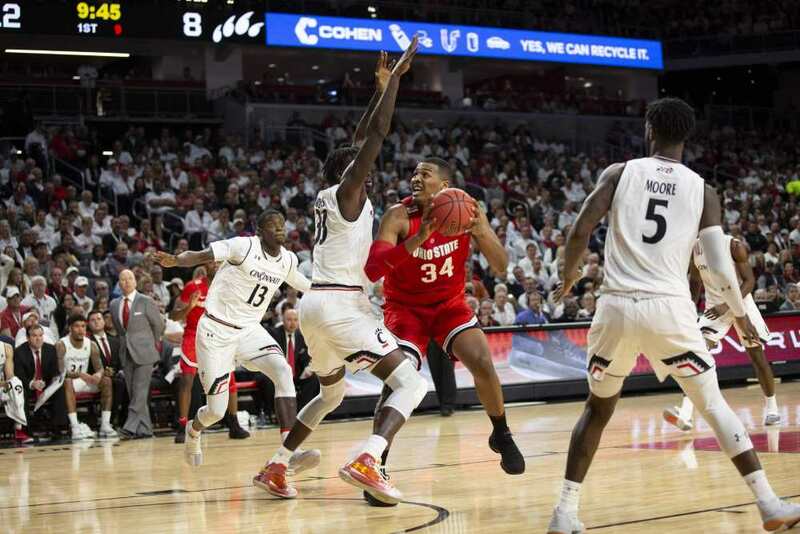 Cincinnati cut that lead down to nine points, but a layup and a free throw by sophomore forward Kyle Young, as well as a pair of free throws by Kaleb Wesson, built the lead back up again. Luther Muhammad made it a 16-point game again with a three-pointer with just 5:23 to play in the game. Muhammad scored 11 points on the night in 29 minutes. His +/- of +16 was the best number on the team. Cincinnati guard Jarron Cumberland cut the lead to seven points with a pair of free throws with just over two minutes to play. Cumberland then made it a four-point game with a three-pointer with 1:00 to play. C.J. Jackson went on to score the final four points of the game, dropping in a layup and then hitting a pair of free throws to make the score 64-56. The Wesson brothers spent quite a bit of time in foul trouble, but the Ohio State defense allowed the Buckeyes to withstand every obstacle they came up against. The Bearcats shot just 17-62 (.274) from the field and 6-26 (.231) from three-point territory. There may never be a play drawn up for Kyle Young this year, but through effort, will, and sheer hyperactivity, the Buckeye sophomore is going to be the lifeblood for this team at times. Until C.J. Jackson and Kaleb Wesson finally took over late, it was Young who was leading the team in scoring, minutes, rebounds, and was second in +/-. Young finished with 10 points on two field goal attempts. He made both, but also added 6-7 free throws and eight rebounds. He played 36 minutes, and in so doing, gave everyone a pretty good idea why Micah Potter decided to transfer. + The confidence that freshman guards Duane Washington and Luther Muhammad play with is pretty refreshing. They are rookies but they command the ball and fly into the paint like they are veterans. Neither of them is shy and they don’t wilt. They won’t always make the proper decisions this season, but they’ll do it full speed and without an ounce of fear in their actions. + Tom Orr and I talked a bit about this team on Wednesday’s latest edition of the Buckeye Weekly, specifically about Chris Holtmann getting this team further than people would expect. We saw a hint of that against Cincinnati. The OSU defense was stifling and it allowed the Buckeyes to stay in the game while their own shooting issues had to be worked out. Holtmann is able to get so much out of each player. Look at Musa Jallow, for instance. Jallow stayed in his lane and played tremendous defense. He blocked a couple of shots and didn’t force anything offensively. His +/- of +8 was the third-highest on the team behind Muhammad and Young. Both of those players are on the court for their defense as well. + The Buckeyes had just seven assists on their 20 made field goals, but the ball moved pretty well. If anything, it was encouraging to see this team have multiple players who could break their man down and score in one-on-one situations. That was a concern coming into the season, but Keyshawn Woods, C.J. Jackson, and Luther Muhammad all showed an ability to both drive and pull up for quick jumpers off the dribble. The shots won’t be falling every night, but that’s when the defensive intensity that Holtmann preaches comes in handy. + Andre Wesson only played 17 minutes because of foul trouble, and his +/- of -4 was the worst on the team. However, none of that mattered to him or impacted his confidence when he hit a pair of clutch threes in the second half to give the Buckeyes breathing room. + This was a great win for a Buckeye basketball team that was supposed to be served up on a platter for the University of Cincinnati. Turns out, however, that Buckeyes are still quite poisonous. + How about a little celebration. So this is what very good coaching looks like top to bottom, only saw the first 10, but this is a disciplined, well coached team. Good job. Great beginning to the season and nice halftime adjustments to get a great start to the second half. Played tough down the stretch. I, too, am a longtime fan, Longtime Fan, a former resident of the Cincinnati area and was both a Buckeye and a Bearcat, but don’t know any obnoxious UCers. Also very glad to be in OH. Yes, Margaret, the refs seemed one sided, and yes, Dallas Buckeye, Coach Holtmann is the real deal. He will have to emphasize just go play and keep quiet about the officials. They became a little rattled with the one way touch fouls. Trash talk must be minimized, the “T” was warranted, but Muhammad is also the real deal. Good future. What a nice surprise game by Young. 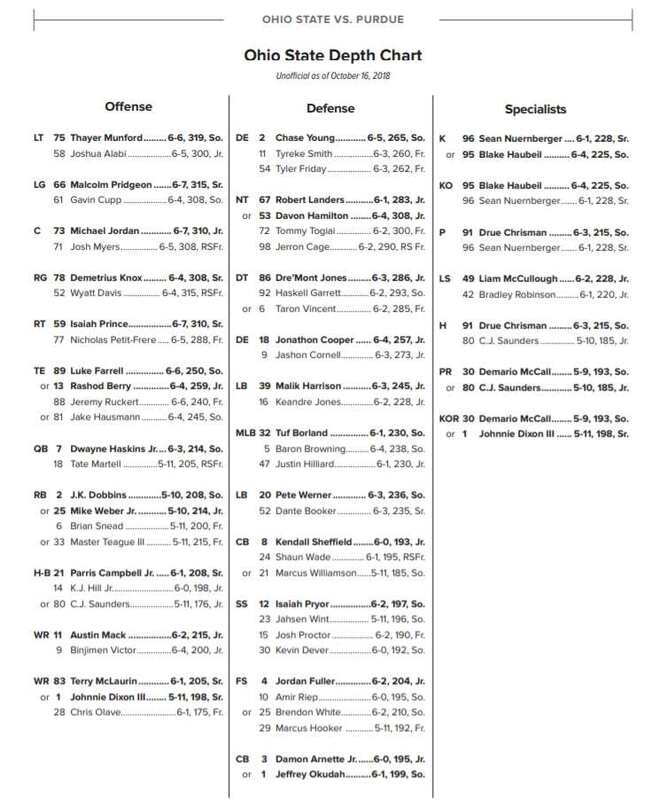 This team is going to be fun to watch! Mal00- You don’t know any UCers who cannot stand OSU athletics for no legitimate reason, anywhere in the vicinity of the last FIFTY years of sporting events? Yeah you do, nice try though. Both comments above spot on! Great win, and impressive beginning. Holtmann the real deal both as coach and recruiter. Thumbs up! Those had to be the worst referees! So obvious they were pro Cincy. They missed or screwed up so many calls. Even the announcers said so! That technical foul was a joke! YEP, I watched the first and my wife watched the second and we those were the same word we had as I came home from a meeting. This win is funny because of the obnoxious, unrequited hatred some UCers feel for OSU. Stick it where the sun doesn’t shine and, for the record, I wish your city was part of Kentucky too. Those folks are bores.